Many of you will probably be skeptical, but for the last few years I have had great success establishing a no-till wheat food plot planting. Normally wheat is supposed to be planted approximately 1-2″ deep using tillage or drilling, as this ensures that the seed is placed in direct contact with soil and will receive adequate moisture for germination. While putting seed below the surface is the best method of planting a large seed like wheat, it isn’t the only way. With just a few household tools that you likely already have, you can plant a very successful wheat food plot at a low cost. First, find a location that receives adequate sunlight- I suggest at least 6 hours of full sun. 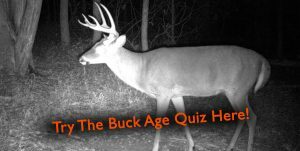 This is probably one of the most overlooked factors that adversely affects the success of food plots and leads to failed plots and money wasted. If you are in a shady spot and there are trees bordering your food plot that are shading it, take some time and drop them with a chainsaw. It will greatly improve the production of your plot and add cover to the edges, plus deer will devour the stump sprouts! Next you will need to prepare the seedbed. I know what you’re thinking- “I thought this was no-till wheat, can’t I just plant?” But even in no-till scenarios exposing bare ground for your seed is essential to ensuring planting success. 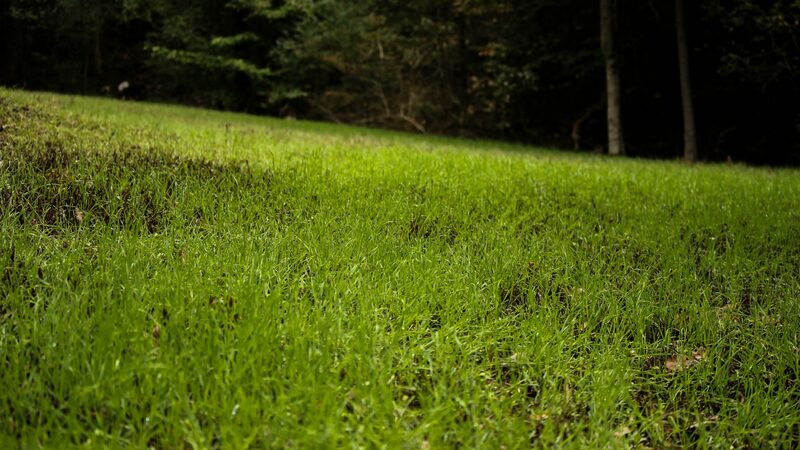 To do this, we will first mow the existing vegetation with a bush-hog, mower, or string trimmer. Now, let the plot sit for 1-2 weeks and allow the mowed vegetation to replace some leaves and begin growing again, as this will ensure that there is plenty of leaf area for our herbicide. Now spray the plot with Glyphosate (the trade name is Round-Up, but generic brands of glyphosate are much cheaper). Prepare a backpack, hand-held, or tractor sprayer tank and spray at a 2 quart/acre rate. You should see the vegetation begin to die in a few days to a week, and the plot should be brown in 2 weeks. Now that your plot is sprayed and the vegetation is dying, you are ready to plant! You can either wait about two weeks for the vegetation to die and then plant, or plant immediately after spraying. I personally prefer planting within a day or two of spraying the plot as long as a good rain is in the immediate forecast. This way, there is adequate moisture for the top sowed seed and the thatch created from the mowed and sprayed vegetation acts as a mulch to insulate the seed and hold moisture close to it for germination. It is not advisable to sow wheat if there is not a high probability of a thorough, soaking rain within a week, as doves, turkeys, and other birds will find your wheat and eat it all up before it has the opportunity to germinate. Sowing wheat at 150lbs/acre is the maximum seed rate advised for cultivation, so when no-till planting it may be necessary to raise this rate to 175 or even 200 lbs/acre, as some seed will be consumed by small mammals and birds. With this heavy seeding rate you should expect a great stand of wheat even after the birds get their fair share! (Above) Just 12 days after planting and this stand of wheat is already 4″ tall and attracting deer. Notice the brown thatch of the dying sprayed vegetation below it? One great way to supplement the available forage provided by wheat is to add clover into the mixture. 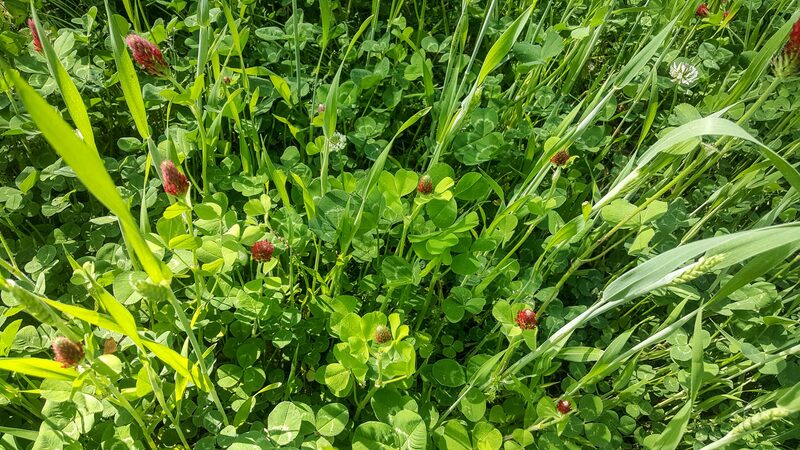 Crimson clover makes a great addition to wheat, as it is also an annual and will establish very quickly and be attractive to deer within weeks of planting. When mixing crimson clover you should cut your wheat seeding rate to 100 lbs/acre and add crimson clover at 15 lbs/acre. Notice, these are both heavy seeding rates that are adjusted to make provision for depredation and lowered germination rates. (Above) Adding crimson clover to wheat increases the diversity of your plot and fixes nitrogen in your soil, cutting down on fertilizer cost. Wheat should germinate a few days after a thorough soaking rain and will shoot up quickly. Even after a soil test, fertilizing, liming, and seed cost this method should produce a great stand of wheat or clover/wheat for under $300/acre in most soils. Within 3 weeks, deer will be foraging on your plot and you can sit back and enjoy the show!